Common Problems - Dobbs Tennis Courts, Inc. Yes, this actually is a color photograph! This court should have been resurfaced many long years ago. Since it wasn’t, extra hours were spent scraping the loose areas, and extra surfacing materials were needed just to get an even base surface. 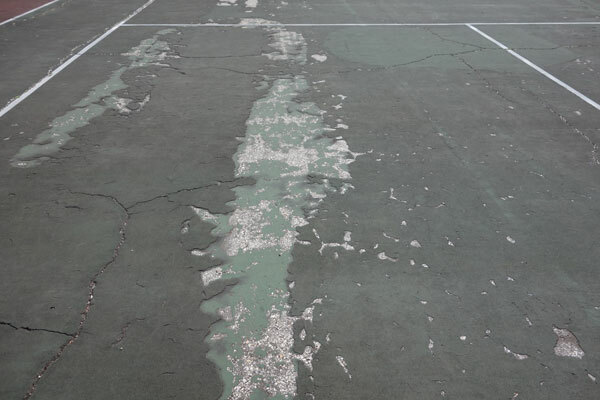 This is an asphalt court, with some wide cracks that have been left untreated for a long time. The top surface has peeled back and worn off, and the cracks have filled up with dirt over time. These cracks need to be washed out and filled with crack-repair material. It is important to realize that cracks are caused by the foundation, not the surfacing material that we apply. Resurfacing will fil all these in and it will look pretty for a while. How long is anyone’s guess as the foundation can and will continue to move, expand, and contract. 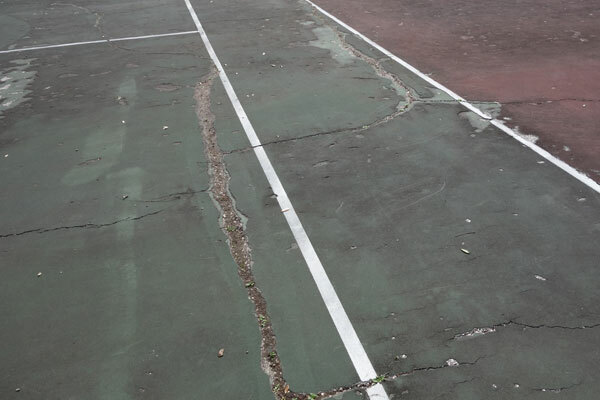 Cracks in concrete courts, especially in post-tension courts, usually have much smaller cracks, if they appear at all.